The 0700L touchmonitor can be applied as a second, customer-facing display in retail environments and can also be installed as the main display for applications requiring a small screen. End-cap shelf displays in retail settings or as personal gaming screens as part of a larger interactive gaming table benefit from the features and design of the 0700L. 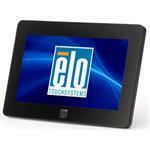 The 7" display utilizes DisplayLink technology that allows for power, video and touch signal through only one USB cable.